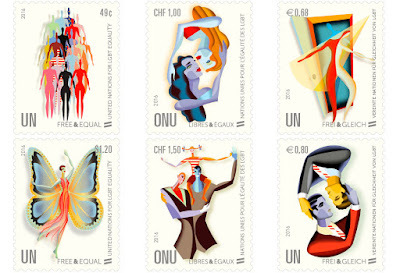 The United Nations Postal Administration (UNPA) today unveiled a set of six commemorative stamps to promote UN Free & Equal – a global UN campaign for lesbian, gay, bisexual and transgender (LGBT) equality launched and led by the Office of the High Commissioner for Human Rights (OHCHR). The new stamps, which celebrate the diversity of the LGBT community, mark the first time the United Nations has issued stamps with this theme. The set, which features two in English, two in French, and two in German, will be available as of tomorrow at UN Headquarters in New York, Geneva and Vienna. They can also be purchased online. Given that the stamps are only valid for letters posted at UN offices by tourists, we wont be seeing many of them in the post. Celebrate utterly appalling design. Even the worst art deco was better than this. Begone, heathens ! !